Officials and Scotty's House representatives hung 245 ribbons in front of the Brazos County Sheriff's Office. Each one represents a child recovering from abuse. BRYAN, Texas — Members of law enforcement partnered with Scotty's House, a local organization that helps children recovering from abuse, commemorated Child Abuse Prevention month in a memorable way. 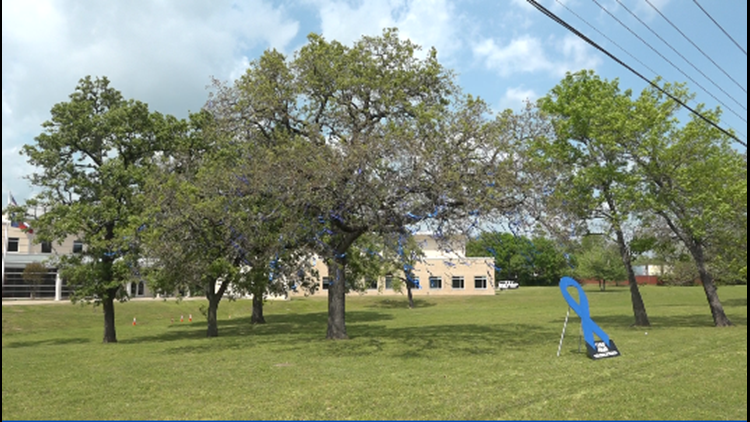 Officials hung up 245 ribbons on the tree in front of the Brazos County Sheriff's Office on Thursday afternoon. Each ribbon represented a child recovering from abuse. “This is Child Abuse Prevention Month, and so what we did here today is called blue ribbon day. And it’s actually to bring awareness to the plight of child abuse in our community,” said Brazos County Sheriff, Chris Kirk. Each child represented by a blue ribbon was helped by Scotty’s House in the last year. "What's important is for our community to know is that we have this in our own community. We don't like to admit it, but it's still important that we acknowledge it, and we do everything we can to prevent it," Sheriff Kirk said. While the ribbons were hung in conjunction with child abuse awareness month, Scotty’s House works year round to provide children with a safe space while recovering from physical and sexual abuse. “It’s easy to forget about the number of children who are being abused in our community. We have hundreds of kids that we serve each year. They come through our doors every day,” Scotty's House Executive Director, Cary Baker, said. And Baker said those children represent a small fraction of a much bigger problem. “Statistics show that one in 10 children will experience some form of sexual abuse before their 18th birthday, but only 10 percent of those are gonna tell someone. So we saw 245 of those last year in Brazos county, multiply that by 10. That’s really the number that’s gonna be out there,” she said. Baker feels that the ribbons are a reminder that you might not see victims of child abuse, but they are there.